Some of you might have heard and even seen that Thule (luggage and car roof rack giants extraordinaire) has started making backpacks for outdoor adventures. That's right, the brand that dominates the "on top of your car" bicycle rack world and apparently luggage world has entered the outdoor scene on a new avenue. 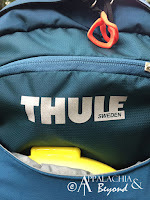 They have two new style packs that just recently launched and I was fortunate enough to be given an opportunity to try one out...The Thule Capstone (32L edition). Upon arrival, I could tell this was more than just a day pack, indeed it could also be used as an adventure pack and even an overnight lightweight backpack. I couldn't wait to get it out in the field for testing but alas, wait I would have to do. Fortunately I didn't have to wait to long to really put it to the test. Robin, Baby Bug, and I was able to steal away for a while on the Fourth of July for a little day hike in the Smokys. 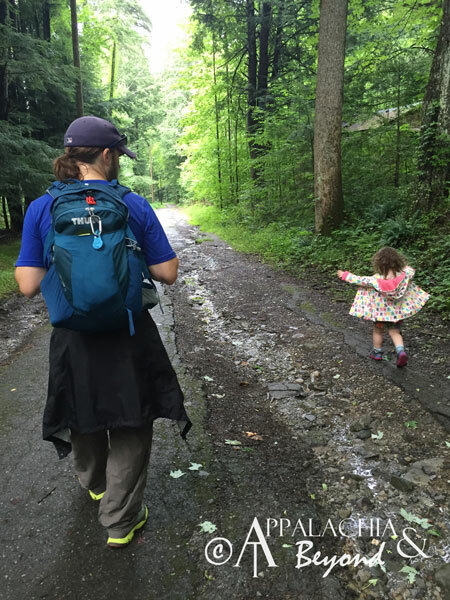 Our hikes are rather limited these days with us both working, the kiddo working, and of course the Bug always having to be accounted for. But we try not to let all of that get in our way. On this hiking trip the Capstone was perfect. The fit, once adjusted, was amazing, and the micro adjust suspension system allowed for the correct torso length as well as helped in keeping the weight of the pack off your shoulders. 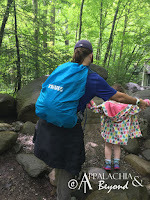 For the hike that day, I was able to carry our snacks, and normal day hike gear, along with the normal toddler gear needed for a day out and about (pullups, snacks, milk, extra clothes, and much more). 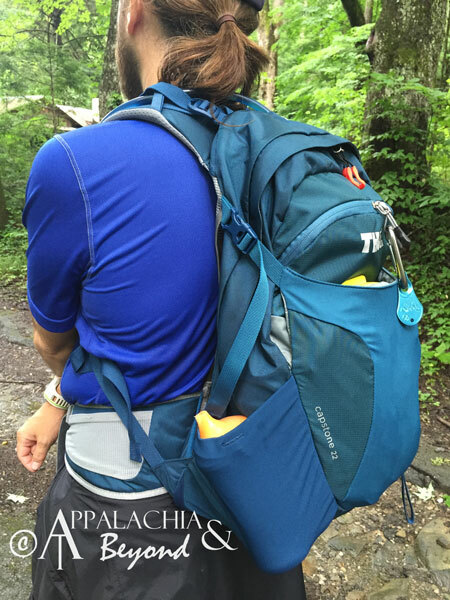 The main compartment is quite spacious even with a bladder in this hydration compatible pack. 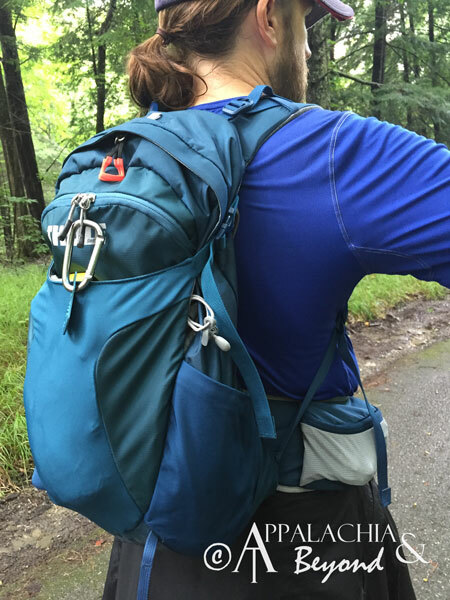 A secondary pocket on the outside back part of the pack is perfect for shoving a rain jacket in or other gear. To water bottle pockets on the side are nice as well, as they can carry extra hydration or sippy cups for the littles in your troop/troupe. There is one extra zippered pocket towards the top of the pack perfect to hold cell phone, or any other small items. 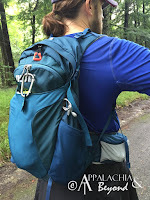 The pack also has side straps to help compress the load and give the added ability of strapping on extra gear, sandals, or whatever else you might think of. 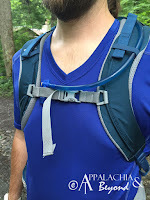 There's also a zippered pocket on the hip for easy access to snacks, keys, headlamps or blade if so desired and another stuff pocket on the other hip for smaller items like gels (you know if you were trail running or adventure racing with this thing). Finally there's a small zippered pocket on the bottom of the pack that contains a rain fly for the pack which deploys easily when in a hurry to keep your gear safe from the elements. On our hike in the Smokys, it had been raining early on so I did get to try it out although, once we got on the trail there was really no need other than the few drips from the canopy of the forest. The pack rides on the back quite nicely and as I've mentioned already doesn't rest on your shoulders which is nice. Most of the weight rides directly on the hips so no sore shoulders after a long day of hiking or backpacking. There's also no bounce to the pack either which is great as you maintain your center of gravity the whole trip. 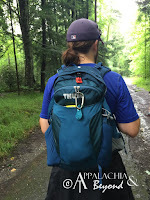 With plenty of room for the necessities of day hiking and extra for the occasions you need to get away for a quick over-nighter, the Thule Capstone is the perfect pack for the job. I've yet to go for a run with this thing, as I've not done anything longer than a marathon in the past two months, and really don't carry enough gear on those sorts of runs to justify it, but I just might have to try it out in the next week or two in order to see if it's worthy of adventure running. I would say it likely is but again, only time will tell. As for day hikes though, this is my new go to pack. I won't be leaving the house without this one for sure. Heck I even use it to carry my change of clothes when I go to races or my long runs. I highly recommend this pack for hiking and adventures. It's definitely versatile and rather durable too. 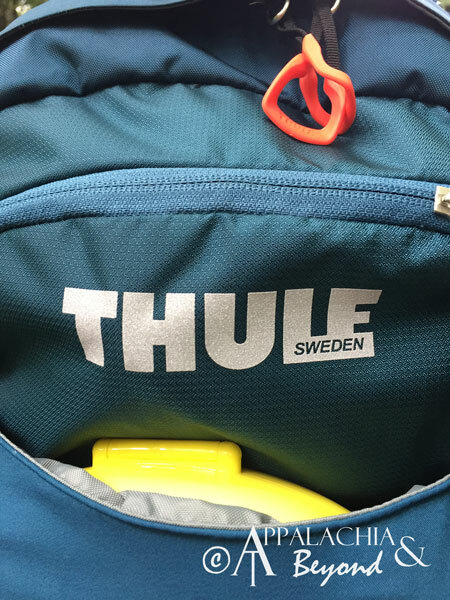 Disclaimer: Tim received the Thule Capstone 32L backpack from Thule for review purposes only. Tim is not being compensated for this review. The opinions expressed above are Tim's independent thoughts and experiences.